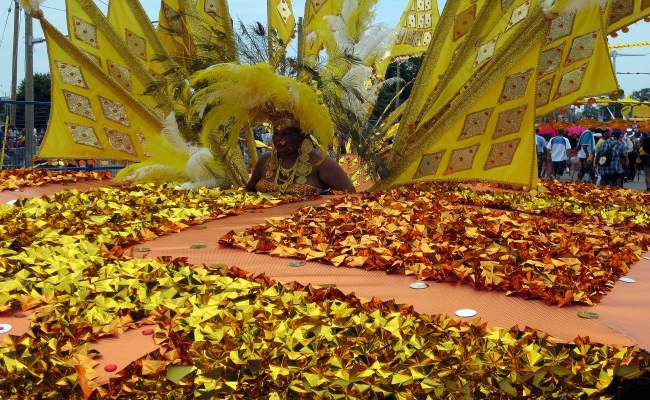 Come July and Caribbean Carnival Toronto (formerly Caribana) takes the centre stage of Toronto's busy event schedule. Every year close to one and half million people come together for a true celebration of the Caribbean culture featuring four weeks of revelry and an explosion of activities to heighten each of the senses. This incredible, international event continues to draw more and more visitors each year and holds the great distinction of becoming the biggest cultural festival of its kind in all of North America. Whether you are interested in the cuisine, the music, or the visual and performing arts, the Caribbean Carnival definitely has something for people of all ages to enjoy. Perhaps it's the mouth-watering foods, or the bright lights and the pulsating music that draws you in closer, or the friendliness of the people, or maybe it's the vibrant, colourful exhibits that surround you. Whatever it is, the largest street party in Toronto is sure to leave you wanting to come back year after year. A true expression of the city's multicultural residents, Scotiabank Caribbean Carnival Toronto festival began in 1967 as a three day event for the Caribbean community to contribute and partake in Canada's centennial celebration. In the late 1980s, other groups from countries in Central and South America and Africa as well as Haiti, the Bahamas, and even Canada joined in on the festivities to add even more culture to the grand festival. What was first inspired by a carnival held each year in Trinidad before the Lenten season, the three week long Caribbean extravaganza has now become the perfect way for residents to express a multitude of traditions with food, music, dancing, singing, and a wide range of art exhibits and performances. Caribbean Carnival Toronto begins with a grand afternoon event featuring a large selection of Caribbean inspired foods including Cuban, Jamaican, and Trinidadian cuisine, live music, theatrical performances showcasing life in the Caribbean and Hundreds of both official and unofficial events abound at the Caribbean festival. While exploring the many of the events, you will find shows going on inside of calypso tents, mas or masquerade competitions with lavish mask and costumes, and junior carnivals where the youngest members of the community perform. Be sure to stop by one of the many 'talk tents' where you will be able to experience one of many oral traditions known to the Caribbean culture. Storytellers and comedians await you to tell fascinating tales and make audiences laugh with glee at the carnival. The King and Queen Show at the Caribbean Carnival Toronto is one of the carnival's most talked about events. After a king and queen are chosen, they each don huge and elaborate costumes transforming them into giant 'birds' before performing for the eager crowd. If you're an avid music lover, various musical events are sure to delight you. The festival features so many different magnificent performers that give listeners an audio and visual treat with their various types of music and dance. Just some of what you will hear include soca, a newer form of soul and calypso music combined, and cadence, which first originated in Dominica and Haiti, some Latin salsa music, zuk from St. Lucia, and most recently, even rhythm and blues and rap, both from North America. Steel drums are another huge part of the Caribbean music culture and every year talented players can be found at the festival at the popular Pan Alive musical performance event competition. Steel pan drumming originated many years ago in Tobago and Trinidad and performers of the event aim to wow the panel judges and spectators outdoing themselves each consecutive year. You also won't want to miss the many street parties' steel drum bands called 'blockoramas' or 'pan blockos' going on at the festival. Besides steel pan drumming and tassa drumming, which is an eastern Indian tradition originating in Trinidad, calypso music is an integral part of the Caribbean culture. Often said to be 'the grandfather of reggae', calypso music is featured throughout the festival. The 'Kaiso 365' is the musical competition in which some of the most talented performers compete against each other to be crowned as the best 'Calypso Monarch' of Canada. The winner then goes on to perform in several events throughout the Caribbean Carnival Toronto. Or, if you want to quietly enjoy the festival along with the surrounding scenery, have a picnic on Toronto Island followed by a moonlit cruise on Lake Ontario and be prepared to be amazed at the gorgeous view of twinkling stars above. The Royal Ontario Museum features an exhibit straight from the Caribbean Carnival Toronto, a massive collection of over 100 works from African-Canadian artists. But all fun aside, the great economic impact the annual Caribbean Carnival Toronto has on the Toronto tourism industry is most definitely worth noting. Millions of dollars are spent every year at the festival on souvenirs, hotel rooms, in restaurants, car rentals and on taxi rides around the city. The next Caribbean Carnival Toronto season in 2013 is slated to be a full four weeks of celebration ending as usual with the traditional parade on the Lakeshore and a grand party that is sure to be remembered long after the festivities have subsided. Due to the nature of the festival, it is hard to provide these details. However, you can use following tool to get direction to your desired event venue.